Dear friends, we are officially off: today we are starting treatment of Volodymyr who recently joined the «Biotech». On Tuesday the man arrived in the clinic where he underwent all necessary examinations, tests and even a surgery. In its course the doctors removed a broken screw that prevented to carry out the MRI test, and studied the injured joint closely. This will help to carry out additional examinations and allow to come to conclusions as regards further treatment. Volodymyr suffers from acute instability of the knee joint. This means his knee is unable of functioning: the bones that are implied to move in strict correspondence with one another, just helplessly shake from side to side. This causes strong pain while walking or under any other load, as the knee fails to perform the due job. Moreover, this may result in further serious complications which will require much more time, money and efforts to get healed. Volodymyr got wounded in the ATO zone. The man served in a division that maintained and guarded heavy self-propelled guns. Under the continuous enemy shelling Volodymyr’s knee was getting more and more injured by constant load like jumping off the armour or dropping into a trench in full ammunition. The worst happened during another shelling: the man rushed awry, twisted his leg badly and nearly fainted because of acute pain in the knee. Primary treatment carried out in the state hospitals did not help. According to medics’ version, pain in the leg was caused by an old injury Volodymyr had got in a car accident about five years ago. Moreover, during the operation on removal of the old plate fixing that olden fracture, the doctors broke one of the fixative screws. The scrap that was left in the knee, was impeding full MRI scanning. So the man was just released from the hospital and offered to simply suppress the pain with painkillers. The examination within the Bioengineering Rehabilitation for Wounded project revealed that it was the consequences of a mechanical injury which caused the pain. In Volodymyr’s leg, the cruciate ligament responsible for the right position of bones in the joint (including their interaction during walking), went raptured. On this reason, the joint lost in functionality and the bones started to ruin one another mechanically. If not treated, the ruining of the bones will go on and lead to the necessity of an artificial joint implantation, at least. Within the Biotech, the doctors are going to perform a surgery aimed to restore proper combination of bones and ligaments. 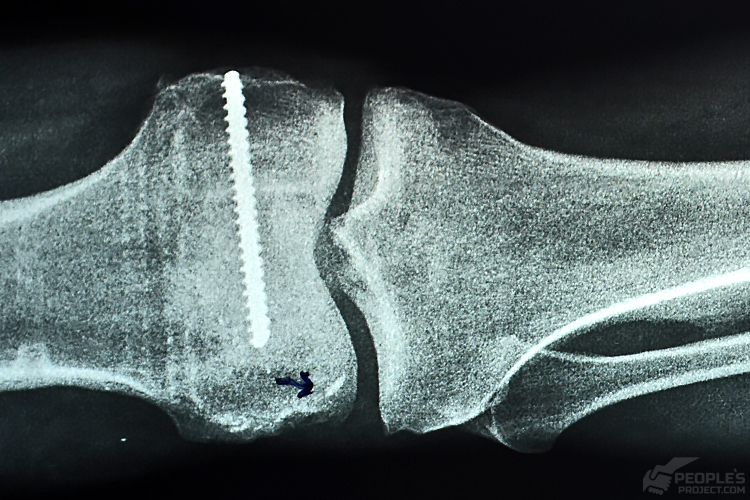 The exact strategy is to be defined after extended examination following the screw fragment removal. Volodymyr is a father of eight children; he is just an ordinary good fellow from Chernihiv region. Despite he had full right to refrain from the military service, he went to the war without hesitation: simply because he decided that if it was not him to defend his homeland, then who would? 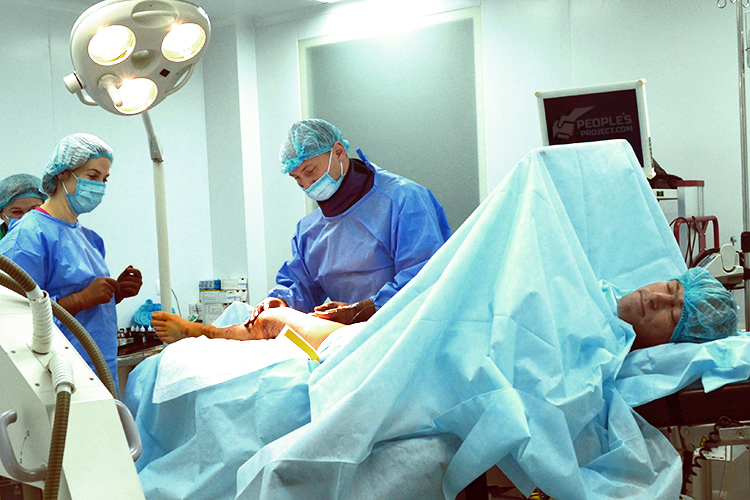 It is worth mentioning that Volodymyr needs more than just surgeons’ care. Because treatment within the Bioengineering Rehabilitation for Wounded is possible at the expense of people’s donations accumulated by People’s Project solely, – unfortunately, the state has already said its last word of rejection. A major part of the sum for Volodymyr was raised by a wonderful girl, Myroslava. Despite the girl is fighting against the consequences of severe disease herself, she managed to amass about 50 thousand hryvnias for the first stage of treatment – we told you about this here. The second stage is our shared responsibility: we have to raise and pay another 30 thousand UAH for the man to be able to walk in a normal way. The sum is not that big, but Volodymyr’s recuperation fully depends on it. Dear friends, please participate in his treatment and press the big green button below, – your contributions will help to bring the wounded defender back to full life without pain and suffer.